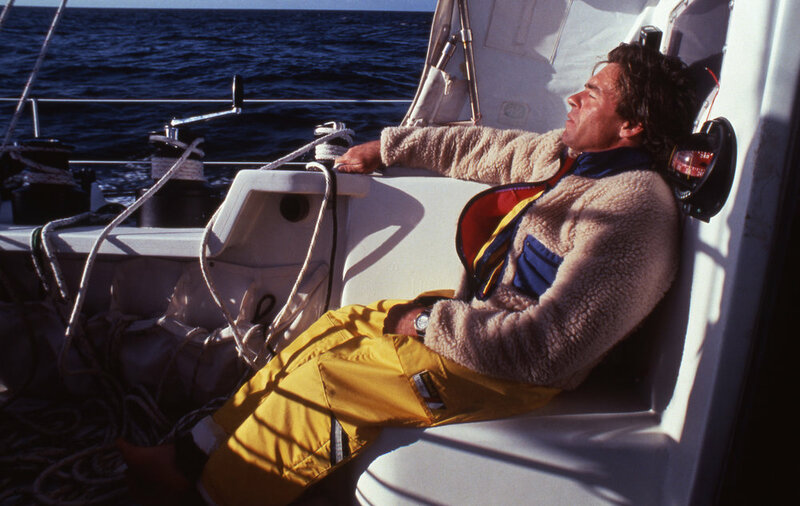 SPANNING THE DECADE FROM MIKE PLANT’S ARRIVAL IN PROFESSIONAL OFFSHORE SAILING IN THE MID 1980’S, COYOTe FOLLOWS plant’s DARING SPIRIT AS HE CHALLENGES MOTHER NATURe — AROUND THE WORLD ALONE ON A SAILBOAt — AND FRENCH DOMINANCE IN THE SPORT. CHRONICALLY UNDERFUNDED AND UNDERMANNED, PLANT’S THIRST FOR ADVENTURE AND FEARLESS BELIEF IN HIS DREAMS DRIVE HIM TO BECOME AN AMERICAN HERO OF THE SEA. HIS WILD BLUE EYES AND BOYISH GOOD LOOKS MAKE IT HARD TO CONSIDER PLANT’S LIFE BEFORE COMPETITIVE SAILING INCLUDED A SOLO TREK OF SOUTH AMERICA, AN ESCAPE FROM GREEK AUTHORITIES ON A DRUG TRAFFICKING CHARGE AND TIME BEHIND BARS IN A PORTUGUESE PRISON. YET, THESE EXPLOITS AND OTHERS REVEAL THE TYPE OF RESTLESS SOUL CAPABLE OF CONQUERING THE WORLD’S OCEANS ALONE. His final creation — Coyote — a radically designed vessel built on the edge of speed and safety, symbolizes Plant’s course in life: racing before the wind, always with an eye to the sea. I have always been drawn to individuals who have the courage to step out and pursue their dreams. As we know, it’s easier said than done. In many ways, our minds are wired with contradiction about the path we choose in life: we are born to run free and chase our true desires, yet often feel compelled - by social influence, family pressures and the like - to trust a cage of commandments and follow the traditional course… a course that frequently leaves our true aspirations behind. When i was a young boy I watched my uncle, mike plant, sail into newport, rhode island after 157 days at sea. family and friends gathered aboard an old tug to watch him win the 1986-87 boc challenge, a single-handed race around the world. 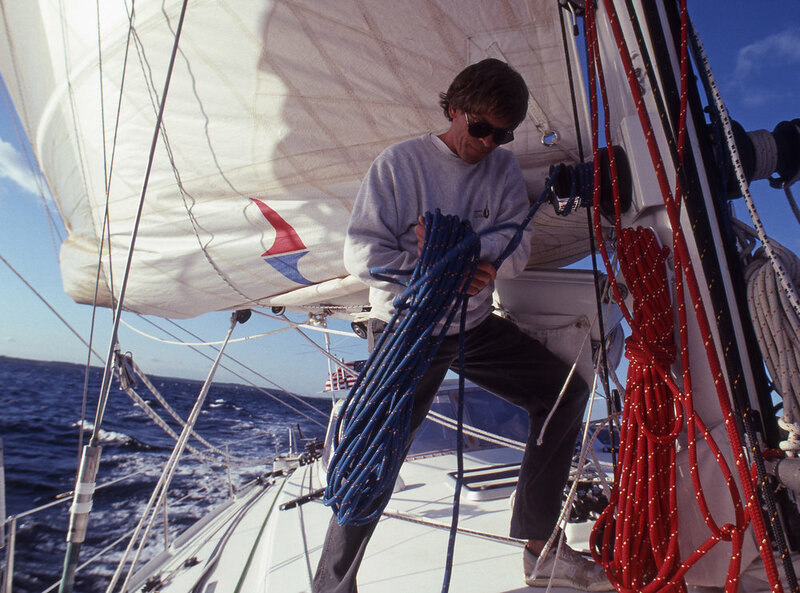 he became my hero - and a hero in the eyes of many, especially those close to the american sailing community. today, I recognize that mike was an ordinary person doing extraordinary things. his story proves that we can all be dreamers of the day… and that it’s never too late to find your calling and chase something that you truly believe in - regardless of where you’re coming from. On the surface, some might see Coyote as a film about an American sailing pioneer with a colorful past. To me, it’s a universal story about redemption, the importance of chasing dreams in life and the power of the human spirit when passion meets determination.